1.Sign on has moved to the Loughside Recreation Centre on the Shore Road, approx. 2.5miles from City Hall, and ENTRIES WILL BE TAKEN ON THE MORNING OF THE EVENT. 2. Sign on will be open from 7.15 and riders are asked to get there as close to 7.30 to avoid the last minute rush. 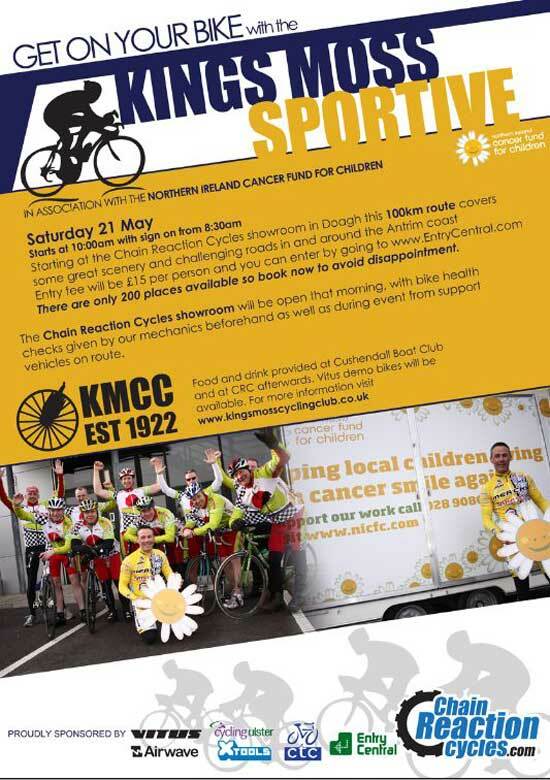 Kings Moss will be promoting their very popular Sportive in aid of the Northern Ireland Cancer Fund for Children on the 21st May. The event starts at Chain Reaction Cycles in Doagh and will cover 100km along the beautiful Antrim coast. Sign-on is from 8.30am with the event due to start at 10.00am. Places are limited to 200 and entry is via Entry Central The cost is £15. Please register for this very worthwhile cause. On Easter Sunday Phoenix CC will run their second Easter Reliability Trial. There will be two runs; an A run aiming for an average speed of 20-21mph, and a B run aiming at 17-18mph average speed. Sign-on will be at the House of Sport on the Malone Rd, Belfast (BT9 5LA) from 9:00 with the A run leaving at 9:30 and the B run leaving shortly after.